Christmas Dinner usually means some sort of roasted meat as the centerpiece, and in my house I usually fall right in step: turkey, goose (actually braised, following Julia's recipe), chicken, or, for a down-home Christmas, slow-smoked pork shoulder. This year it's going to be a very traditional standing rib of beef, with all the trimmings, and since I don't let weather keep me from my grill I'll be doing it outside over a live fire. Of course, we always have drinks and a few nice goodies to keep the crowd happy before dinner begins. This easy crostini is perfect for the occasion, and especially nice with Beau's suggested prosecco. 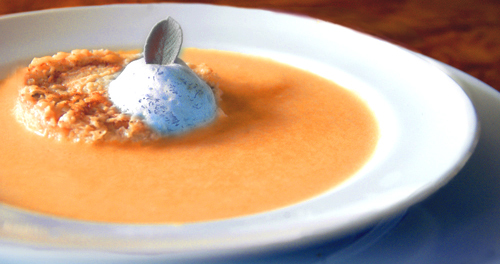 When the guests are called to the table, this festive soup makes a perfect first course: colorful and unusual, with a chewy red-rice island topped with sage foam garnish. And, it can be made ahead of time, except for the foam. 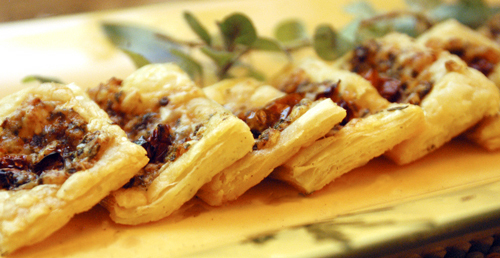 This is a tremendously reliable preparation, always popular and relatively easy on the cook. 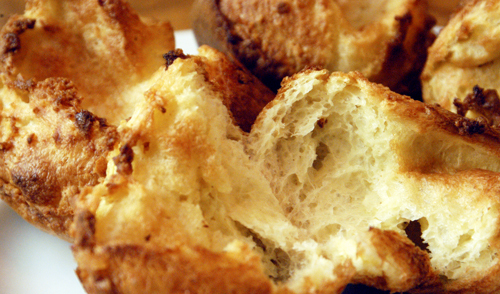 I serve it at Christmas with Yorkshire Pudding, and my old standby, Herb-Roasted Potatoes. This is the traditional accompanyment for roast beef and they make the holiday meal a little more special. 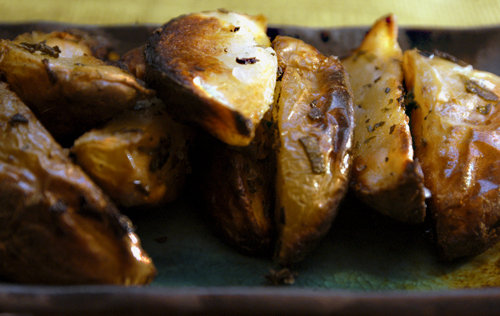 Easy, popular comfort food, these potatoes have been in my repertoire for many years. My all-time favorite vegetable: brocoli steamed and dressed up with a little olive oil and some minced fresh herbs (and maybe some slivered almonds for Christmas). I like to keep salads simple for big meals, and this one is especially festive-looking. 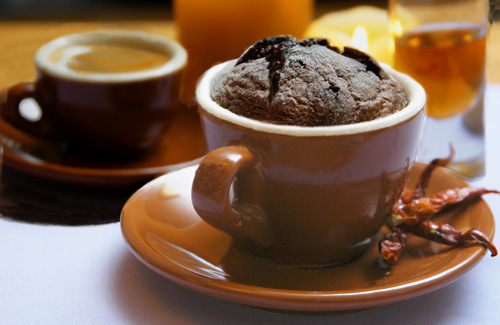 A fitting end to this grand feast is this chocolate soufflé, which has been enhanced - some might say "kicked up a notch" - with espresso and cayenne pepper. We've finally arrived at the end of our Christmas Dinner and we're just sitting around, sipping a little more of the tawny and enjoying a quiet, peaceful evening with family and friends. I had a lot of fun putting this together and I wish you a tasty, happy Christmas! Very impressive. Nice job on this whole series of dishes. Man, this is unbelievable. Great looking stuff. I don't think I'll have time to manage any of this stuff for Christmas Day, but my family will happily appreciate me practicing for an as yet unnamed occasion in the future.